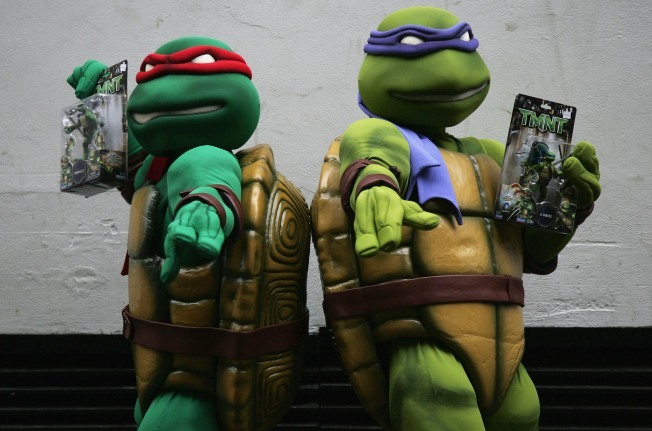 The Teenage Mutant Ninja Turtles celebrate 25 this week with the help of the city. New York is celebrating the Teenage Mutant Ninja Turtles' 25th anniversary this week with what they're calling a "galabunga." To honor the iconic mutant reptiles that were born out of Gotham's sewer sludge, the Empire State Buildingwill be turning green this Thursday and the Tribeca Film Festival is hosting an outdoor screening of the original TMNT film, where a TMNT Party Bus full of Turtle memorabilia will make its debut before setting off on a cross-country, 10-city tour. Because after all, New York is the Turtle's home. Co-creator Peter Laird told the Times "setting them in New York City part was a no-brainer." The film, Teenage Mutant Ninja Turtles, is open to the public and will screen this Thursday, April 23rd at 8:15p.m. at the World Financial Center (200 Vesey Street). Turtle lovers can keep up with the "shell-ebration" at tmnt25.com.